Many water suppliers in BC need to increase the price charged for water. This web page gives you a link to further support and provides an introduction to water pricing for community water suppliers in British Columbia. If you need support in effective water pricing, visit the web site of an Industry Partner with considerable experience in this area. Historically water prices in British Columbia have been significantly lower than in many other parts of Canada. 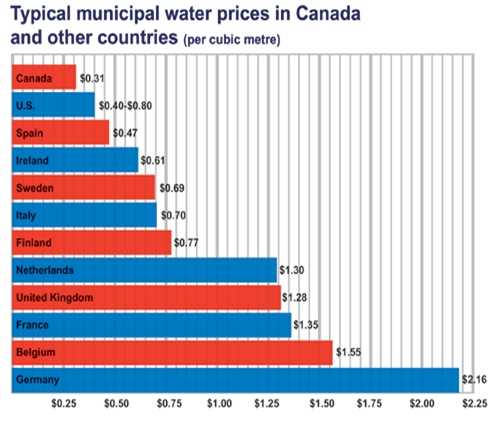 And in turn Canada has some of the lowest water prices in the world. While this may offer short-term benefits to consumers it has serious long-term consequences. Water supply systems have typically not set aside enough money for upgrading their infrastructure. Pipes, pumps, reservoirs and other components of water systems all deteriorate with age. Unless these components are systematically maintained and replaced when appropriate, then the infrastructure will not be sustainable and serious failures can occur. These problems exist in both large municipalities and in small community water supply systems. How much should you charge for water? For comparison, the 2010 water rate in the Capital Regional District (CRD) for the West Shore communities is about $1.50 per cubic meter. An average household consuming 25 cubic meters per month will therefore pay $37.50 per month for water. The CRD water system is much larger than many community water systems in BC, and can therefore achieve considerable economies of scale. This means that smaller community water systems must typically expect to charge more than the CRD in order to maintain sustainable finances. Charges of up to $55.00 per month per connection, or more, may be seen in certain community water systems. As with previous surveys, these price calculations were done for 10, 25, and 35 cubic metres per month. Ten cubic metres is the lower range of monthly water use, while 25 cubic metres is an average family’s monthly consumption. Thirty-five cubic metres represents high family water use. Note: The unit prices shown below are much lower than the actual unit prices in 2011. Data is shown for comparative purposes only.